On this page, you will find a list of all the UA Local 396 Signatory Contractors. Below are buttons listed with the specific services offered by the contractors of UA Local 396. Each page contains lists of contractors who offer the labeled service. Address: 1180 Tibbetts Wick Rd. Address: 1493 Phoenix Road N.E. Charniga Plbg & Heating Co.
UA Local Union No. 396 was chartered on August 1st, 1998. 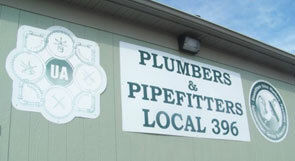 Local 396 is part of the United Association of Plumbers, Fitters, Welders, and HVAC Service Techs. We proudly work in Columbiana, Mahoning, and Trumbull Counties in Ohio and the Grant District in Hancock County, West Virginia.